Yoga can help you relax your mind and body making it easier to get to sleep. Doing yoga for insomnia has proven to be beneficial in some studies. Not only does it help reduce stress, but the breathing and meditation techniques can be used at night to help you fall asleep. Any kind of exercise may be beneficial for stress reduction. However, it is not a good idea to exercise too close to bedtime. It can make you more alert or "awake", especially if it is aerobic activity. Aerobic activity speeds up the heart rate and pulse. So, it acts as a stimulant. Yoga movements are not aerobic. They can help to relax the muscles, which could help you get to sleep. The movements are also beneficial for chronic painful conditions. Chronic pain is second only to anxiety or stress as a cause of sleep difficulties. More and more doctors are recommending alternative treatments for insomnia and pain. Drug treatments provide only temporary improvement. Most are addictive and all can damage the liver. Every drug has side effects and risks. If the benefits outweigh the risks, then the drug is a good treatment option. If the risks outweigh the benefits, it should not be considered. When it comes to the long term use of sleep aids and pain medications, the risks always outweigh the benefits. 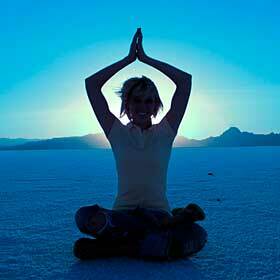 One study concerning yoga for insomnia indicates that the improvement is not immediate. After four months, volunteers’ symptoms had not improved significantly. Try yoga for insomnia. It might just help you relax your mind and body enough to get to sleep. Another study consisted of 120 geriatric volunteers. After six months, there were improvements in all of the volunteers. They fell asleep faster. They slept longer by an average of one hour. And, they felt more rested in the morning. The study was conducted by the Swami Vivekananda Yoga Research Foundation. They compared the benefits of yoga for insomnia to an Ayurvedic herbal remedy. The herbs were less effective. Another study conducted at Harvard Medical School lasted for only eight weeks. 20 volunteers received one training session and were instructed to practice the treatment on their own. The results reported by the volunteers indicated that during the course of treatment the amount of time they slept increased. They fell asleep faster and they woke up fewer times during the night. When they did wake up, they fell back to sleep faster. As you can see, the results of studies have been mixed. The differences might have to do with how well the participants were trained or their pre-conceived notions about the treatment. Even the researchers’ feelings about using yoga for insomnia could affect the results. That’s one of the reasons that multiple studies are conducted concerning the benefits of any treatment. According to researchers at the University of California, the meditation techniques are beneficial for treating psychological disorders. They have published protocols for treating obsessive compulsive disorder, substance abuse, addictive behaviors, dyslexia, grief, phobias, major depression and anxiety. They suggest the Kundalini style of yoga for insomnia and other disorders, because of the techniques used in the tradition. But, some researchers and yogis warn that Kundalini can cause negative experiences if it is practiced without appropriate guidance. In a survey of 233 professional organizations in the United Kingdom, yoga was recommended for back pain and headaches, as well as other conditions. In one study yogic techniques were beneficial for people suffering from fibromyalgia, a chronic painful condition of unknown origin. In another study, 12 sessions improved symptoms of rheumatoid arthritis. When combined with strength building exercise, it has proven to be beneficial for osteoarthritis. While it might not be a quick cure, evidence indicates that yoga for insomnia and painful conditions is beneficial. Give it a try.